Ten artykuł jest także dostępny w języku polskim. / This article is also available in Polish language. An extremely strong propagation occurred on October 27 and 28, which made possible detection of 5 GHz Wi-Fi network signals near Płock, Poland at distances of over 300 km, including… Czech Republic. In last days, thanks to a high pressure system over the central Europe, very interesting propagation conditions occurred on the radio bands. The weather settled down on October 26 and 27 and brought a windless night. The morning, in line with my predictions and tropo forecasts, brought a very strong propagation from southern Poland on the VHF-FM band. 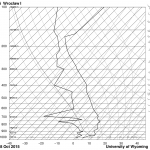 The enhanced conditions were still remaining throughout the day, however significantly weaker than in the morning. In the late afternoon, around 16:30 local time, I decided to check the 5 GHz band for some distant Wi-Fi signals. 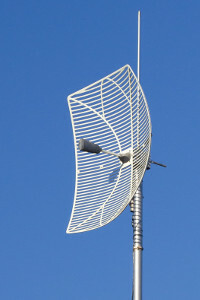 Without any enhanced propagation conditions, the range of reception is limited here up to 10-20 km, despite a high gain antenna (grid 90×70 cm – approx. 30 dBi). This is caused mainly by low mast height (just around 8 m AGL + 114 m ASL). I was very surprised, as I almost instantly found a stable signal called br_ogo2. The networks names often include the location names or their substrings. Using my antenna with a very narrow main-lobe together with a high resolution rotator (1° precision), I was able to estimate the location of this transmitter. I found a village called Ogorzelnik (in Silesian Voivodeship) that matched my rotator azimuth indication at a distance of around 215 km. This was a pretty nice distance to begin with. Of course, this is only my assumption – I don’t know where this network is precisely located, as well as other. The signal level was slowly floating up and down, however due to absence of other networks from this direction in a longer moment I decided to rotate the antenna slowly within 160°-200° range. In just a moment I heard a sound of new network detection. This time the name AirplusN_Slopnice_dookolna explicitly identified the location of transmitter (ISP name + village name + antenna type, dookólna means omni-directional). I checked the maps and I couldn’t believe what just happened. It was Słopnice village, near Limanowa… 325 km away from my QTH! The ISP’s website also confirms this location. Update – the antenna is a sector located around 770 m ASL, not an omni-directional one as the name suggests (source: Trzepak.pl). 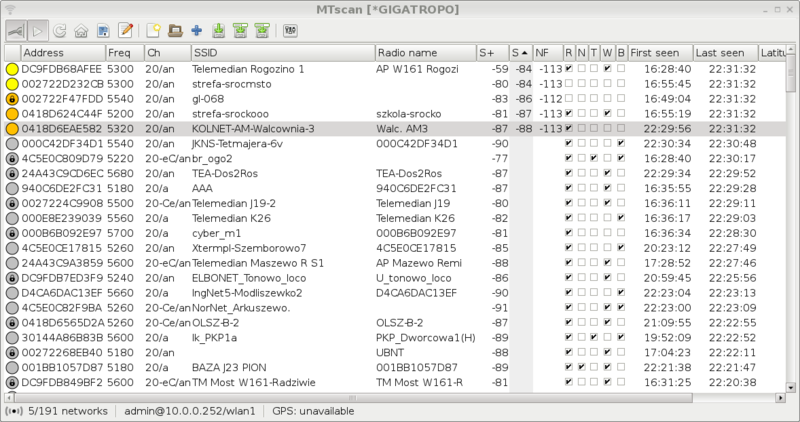 Other networks appeared shortly, coming mostly from surroundings of Częstochowa, but also from Świętokrzyskie Province. The network br_ogo2 mentioned earlier reached a fair level of -78 dBm. Due to a significant count of new incoming networks I was not able to determine all their locations. I was focusing mostly on SSIDs that included an explicit place name. Another key moment was the reception of Andrychów (approx. 305 km) few minutes past 22 local time. I noticed networks: Ventus_Andrychow3_5G_N, Ventus_RoczynyD3_5G_N and other. By the way – network NTL>>>KIET is located at a lattice mast, which was used in the past for NTL television broadcasting in Amelin near Radomsko. The substring KIET mostly likely points to a village Kietlin, whick is placed inline with my direction, at north of Amelin. Despite a considerable distance – 170 km, I have already received this network few times before in the summer, but usually for a very short period of time. I believe that high antenna installation height has an important role in this recurring DX. The IMGW’s weather radar maps (Institute of Meteorology and Water Management), that use the 5 GHz band (5650 MHz) for the precipitation measurement, were evidently interfered by other transmitters. The following map was valid at 23:10 local time. 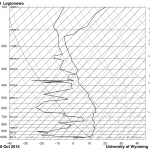 The tropospheric duct was caused by a strong temperature inversion. Such perfect weather provided convenient conditions over a wide area, but of course the best were situated along the lines of an equal pressure. 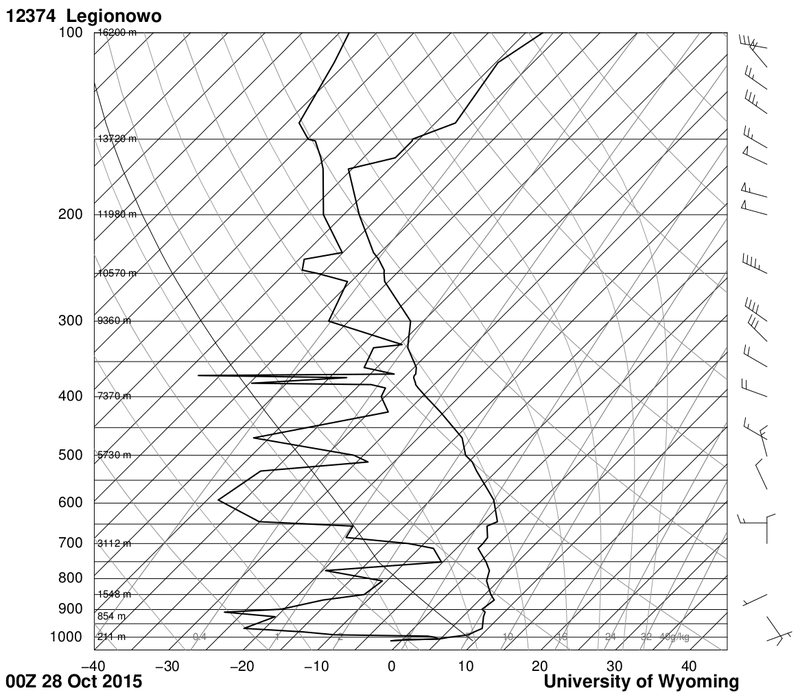 The following map from 00:00 UTC on October 28, 2015 confirms my suspicions. The 1024 hPa isobar goes approximately in parallel with my furthest microwave DX paths. I was observing some historical levels of VHF broadcasting stations from Poland, that still continued to rise. 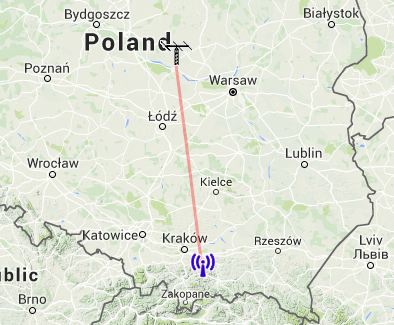 I also noticed a strong audio signal from Ukraine on 99.75 MHz. In fact actually two of them, Kovel in horizontal polarization on Körner 19.3 and Lozova in vertical on 2×9-el, both with 35-40dBf signal. One of the records was made at 00:30 local time. RMF FM 97.1 from Włoszczowa reached 71dBf (-49dBm @ 75Ω, 12kW ERP @ 178km). Anyway, because of a very crowded band with many Polish stations I was focusing mostly on the microwaves. I was very close to the Czech and Slovak border. Unfortunately, this second country is obstructed by some mountains, but I was pretty sure that DX from Moravian Gate in Czech Republic is possible, taking into account what I’ve just logged before… The propagation was quite widespread, bringing southern parts of Poland, including Bochnia (BC_LYCHOW_PN), Kraków (G2B-InfaNET-Wisniowa 310+km), Bielsko-Biała (eurolan-wapienica-3, SPEED-NET-Grawerska-MIMO 310+km) and Czechowice-Dziedzice (KOLNET-AM-Walcownia-3, JKNS-Tetmajera-6v, 300km). Apart from the south direction, I was also receivng lots of networks (actually hundreds of them…) from the west, initially southern, but later also northern. At this point I was pretty sure that I was getting Czech Republic. A moment later, at 2:16 local time, the tropospheric ducting brought another network: hasici (means „fire brigade” in English) AP Martinka5-K, as can be seen on the following recording. A serial console is displayed at the right side of video and it was used to set an antenna azimuth. Maybe I got more foreign networks, however the identification with just a name is rather impossible. A bit longer video (about 20 minutes) is available here: https://vimeo.com/143992097. 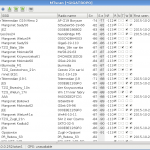 Full log of received networks is linked at the end of this article. 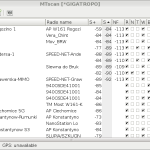 I was also checking the radio reception from Ostrava and the surroundings in parallel to WiFi DX. Interestingly, Hošťálkovice were remaining at stable 30dBf level, i.e. such like during quite weak, typical tropo. The WiFi DX distances were getting shorter as the time was passing and the duct itself was moving slightly west. The signal levels of broadcasting radio stations at shorter distances (100-200km) strengthened up even more and I logged some records of all the time. 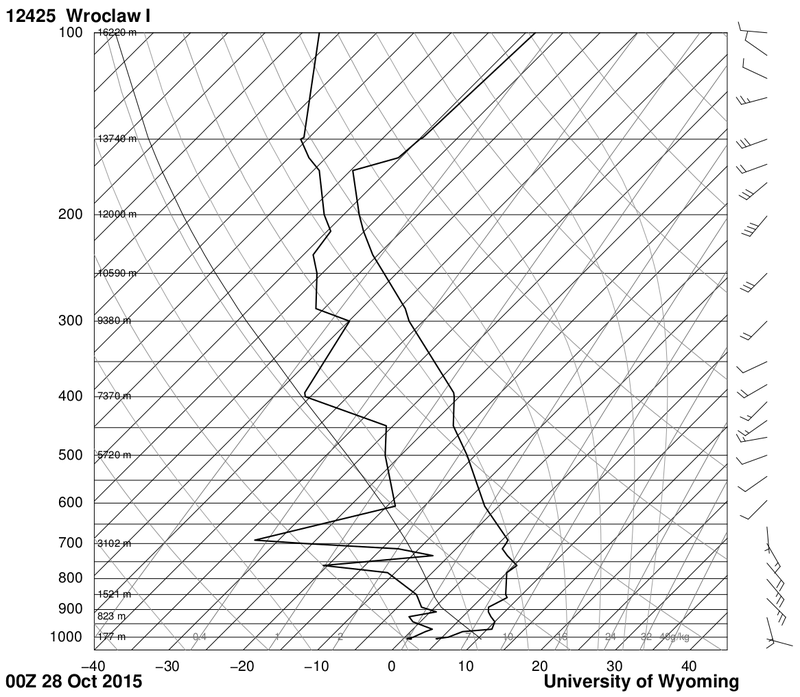 I can say it clearly that it was not a regular tropospheric ducting, but something like a waveguide. I thought that the starry sky replaced itself into… a metal sheet that was reflecting a signal. Taking this opportunity, I also estimated the signal level of an intermodulation on 106.8 (107.3 PR4 + 107.8 PR1), which likely comes from a vertical antenna system on EC-4 chimney in Łódź. As far as I remember, this signal is present all the time and it is definitely not being created in my tuner itself. Let’s calculate the factor with 74 – 37 = 37dB signal difference: 10^(37/10) = 5012x. 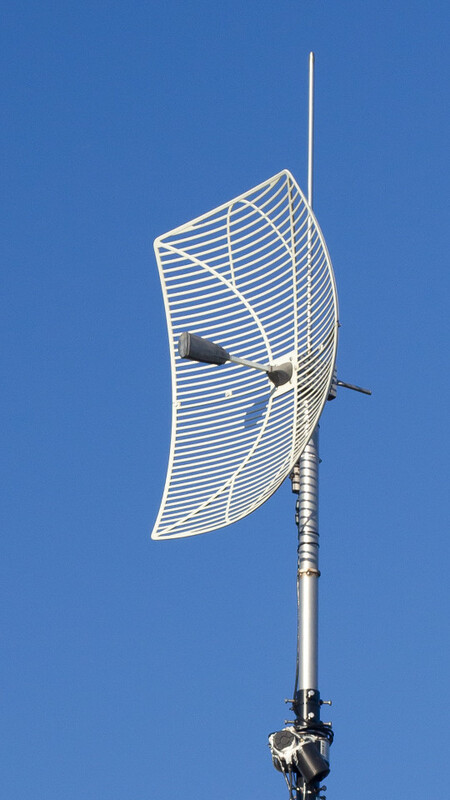 Therefore, the ERP (effective radiated power – together with antenna gain and cable losses) of this intermoduation is something like 0,3 W (300mW). In the morning the microwave duct quickly faded away. Few minutes past 7 I was still receiving networks from Kalisz (~150km) and surroundings but this was definitely the end of such extraordinary conditions. 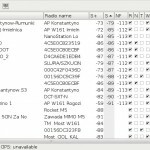 Freq Address SSID Radio name Sig km Lokalizacja? 5260 24A43CE89776 eurolan-mar 0790_Mar->TRW -89 300+ Bielsko-Biała? 5280 00272252A75E eurolan-wapienica-3 -91 300+ Bielsko-Biała? 5540 000C42DF34D1 JKNS-Tetmajera-6v 000C42DF34D1 -89 300 Czechowice-Dz. 5320 0418D6EAE582 KOLNET-AM-Walcownia-3 Walc. AM3 -87 300 Czechowice-Dz. Because of a significant count of received networks I haven’t investigated all of them yet. Perhaps I logged something further than Słopnice (~325km). Czech networks are good candidates. One of them points at the fire brigade building („hasici”) and Martinka 5 street. I should check maps and google street view – maybe I will be able to spot an antenna…? 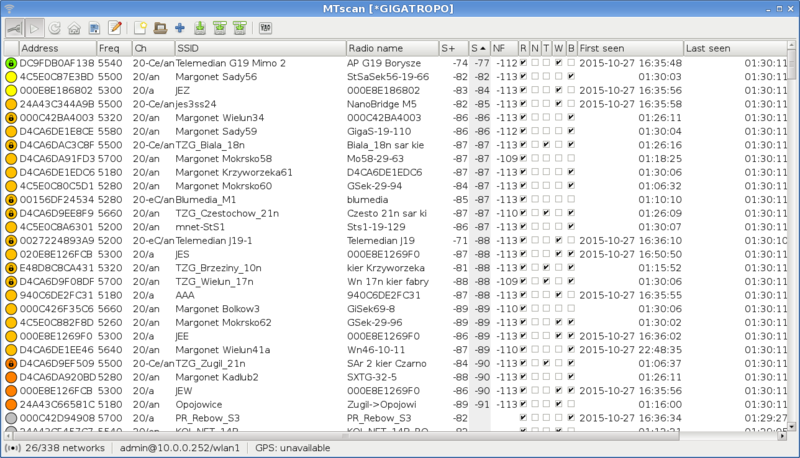 Full log of received networks contains almost 600 entries and is available here (without locals – which are available everytime, regardless of current propagation). My DX setup, located near Płock in central Poland, consists of a grid Poynting antenna (31dBi in horizontal), 8m agl + 114m asl and Metal 5SHPn radio. 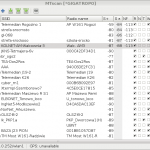 Very cool, I had never thought about wifi dx.